Warning – The following contains imagery that depicts the hard truth. My soul was blackened. Where once I had seen light at the end of the tunnel, now there was only darkness engulfing me. How had mankind gone so far off the track, engaging in such barbaric acts, willful cruelty and reckless destruction? Nature has given us so many incredible gifts, but rather than cherish and protect them, we have set out to systematically eradicate them. Fighting on the frontlines of shark conservation can be a lonely, frustrating and often depressing experience. 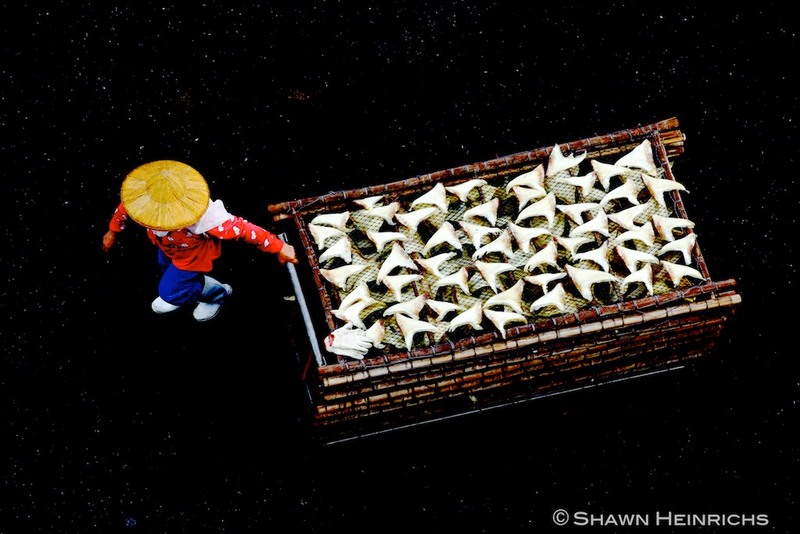 In July of 2011, I had just returned from a long string of investigations focused on the shark fin and manta ray gill-raker trade. With a decade of environmental investigation experience under my belt, I have seen just about every imaginable act of cruelty and wanton destruction. Through these hard experiences I have learned to separate myself, developing an alter ego as it were, to cope in the heat of the moment and not subject myself to increased danger. Over the years I have convinced myself that these two personas can coexist in harmony, that my thick skin and polished armor would safeguard my soul from the effects of the ugliness I have witnessed. I feared that if it the blackness seeped through a crack in my armor, it would poison my soul and I would lose the path. Folks often ask me what it is like to work on frontlines and how do I keep it up. I respond with a safe confident answer that I get used to it, that I maintain professional detachment, keep my cool, focus on the job at hand, and I don’t internalize it. In the face of such destruction, I walk a fine line between bitter reality and hope. My job is to expose the destruction as a wake up call to the world, but also to preserve hope in the future; that mankind will wake up, will change and things will get better. I call this approach ‘strong medicine in small doses’. The problem is, in the process of collecting these ‘small doses’ I have had to expose myself to massive and prolonged doses. And as no surprise, this extreme exposure has proven toxic and painful and only now am I realizing this. I live in a world of imagery. I am obsessed with the visual sense and addicted to the process of capturing powerful images. I am a storyteller and imagery is my medium. My ambition is to somehow get my camera to capture what my soul experiences through my eyes, an enhanced version of reality, order in chaos, focused, isolated and profound. I present the following images and captions as a form of self-therapy; my way of explaining the investigation world I experience, as seen through my eyes, and the darkness that accompanies it. Raja Ampat, Indonesia – After 6 years defending our No-Take-Zone against poachers we intercept a shark boat on the boundary of the protected area. In the water, I look into the lifeless eye of a one of our sharks that had grown up in the safety of the protected area, only to suffocate and die in a gill net, its fins to be sliced off and body discarded. 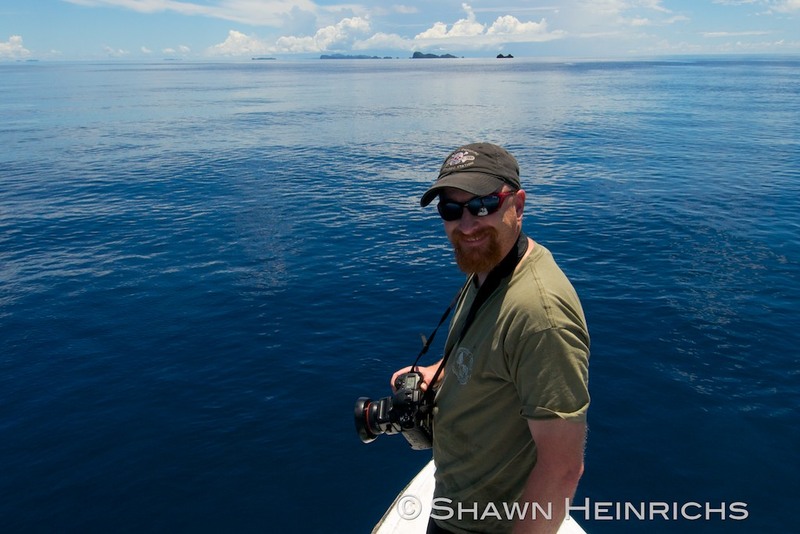 Raja Ampat, Indonesia – Gill nets rake the fragile reefs on the seafloor trapping sharks and rays. My eyes follow the net as it rolls up and over the side o the boat. I watch desperate fishermen pull in the net, laboring against the weight of a Guitar Ray struggling to free itself, exhausted on the brink of survival. Raja Ampat, Indonesia – The bodies of grey reef sharks pile up on the deck of the gill net boat illegally fishing for sharks in the MPA. 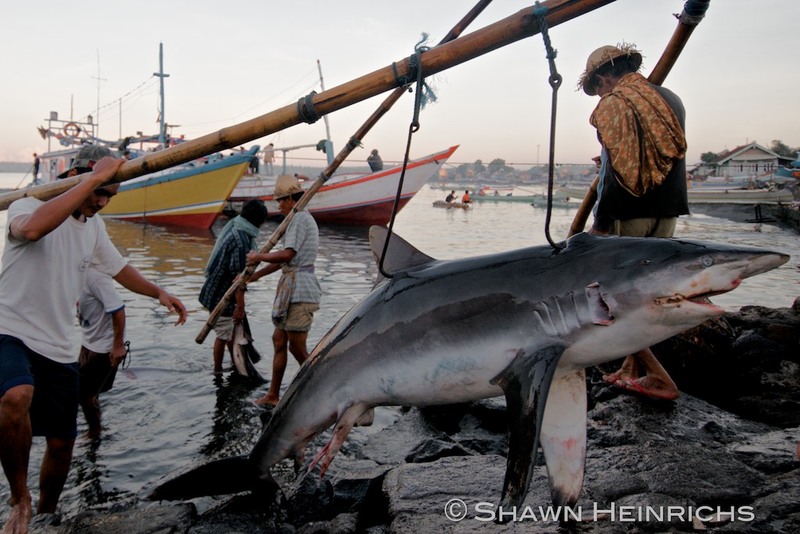 After 6 years successfully thwarting poachers, the depletion of sharks throughout Indonesia drives fishermen to target the last remaining shark stocks in marine protected areas. Raja Ampat, Indonesia – I step back as a young fisherman tosses the lifeless body of a juvenile gray reef shark onto a pile of dead sharks and rays. No shark is too small to be spared from the cruelty of the shark fin trade. Raja Ampat, Indonesia – Like some ancient tribal masks, I stare at heads of sharks and rays drying on the roof of this shark boat caught illegally fishing in the MPA. 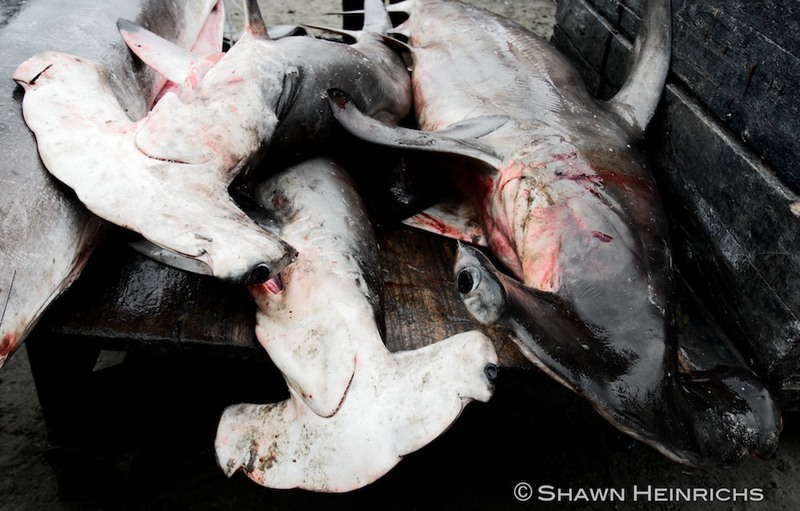 Hammerheads, Guitar Rays and other endangered species are among the victims of this senseless slaughter. East Flores, Indonesia – Motoring across the calm waters in the early morning light, we come upon a local fishing boat. 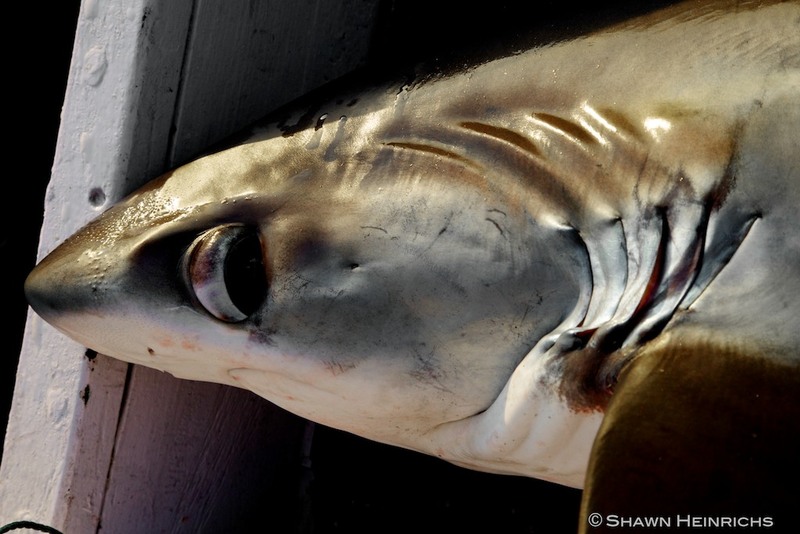 My eyes lock on the dark beautiful eye of a lifeless Pelagic Thresher shark staring up at me, its skin a glistening gold in the warm morning sun. 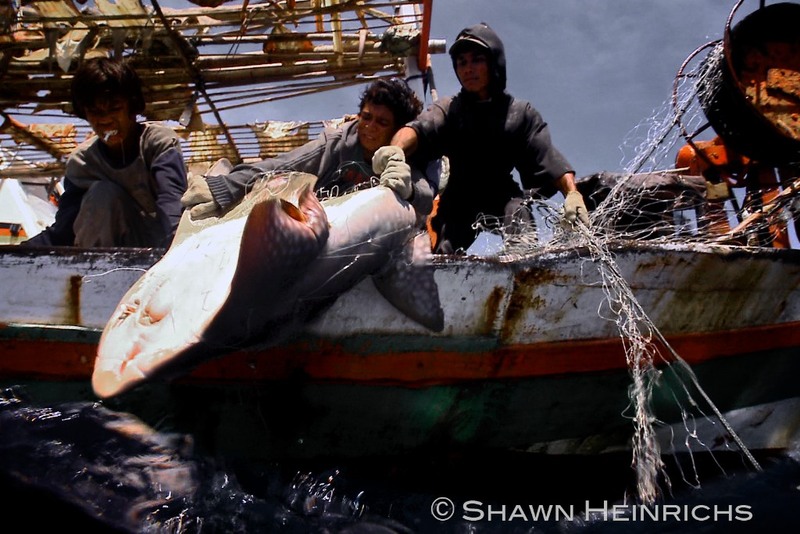 The value of the fins from this endangered shark are driving the mass slaughter of the species in this region. 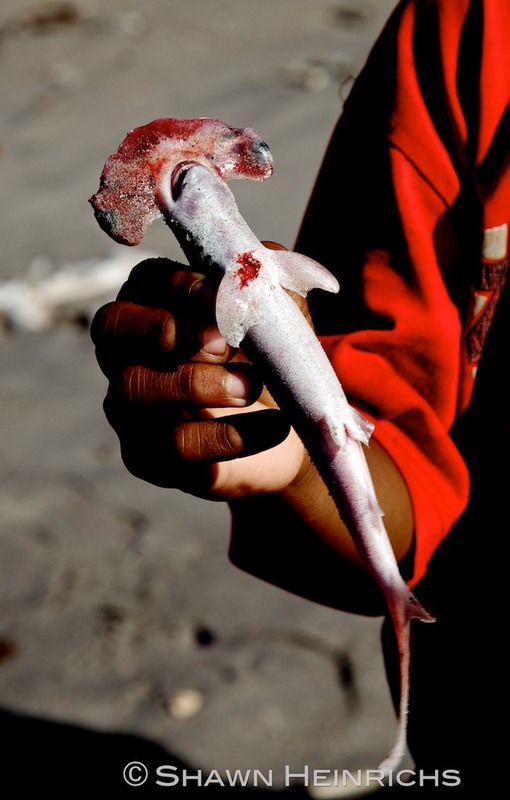 East Flores, Indonesia – An excited village boy holds up a fetal Scalloped Hammerhead, cut from the belly of a large mature female, and like a toy, the children toss it around. 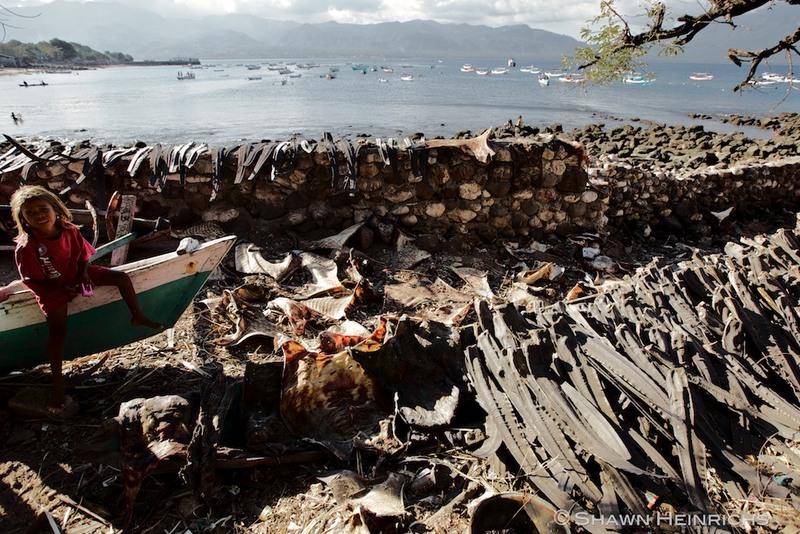 In this remote village, any large marine animal is a target for the spears of the hunters. Later this fetal shark is discarded on the beach, only to be engulfed by the rising tide, lost forever. 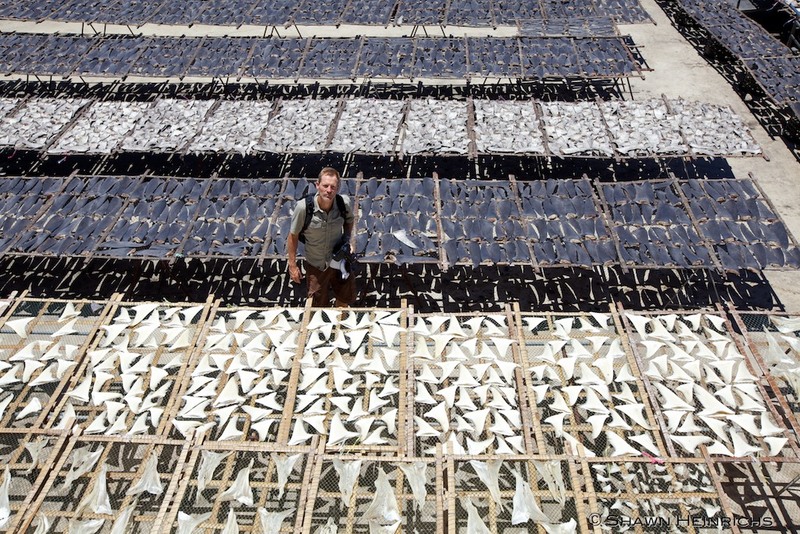 East Flores, Indonesia – I survey the tails cut from hundreds of Pelagic Thresher sharks, now drying in the sun in preparation for shipment to Surabaya and Jakarta fin traders. 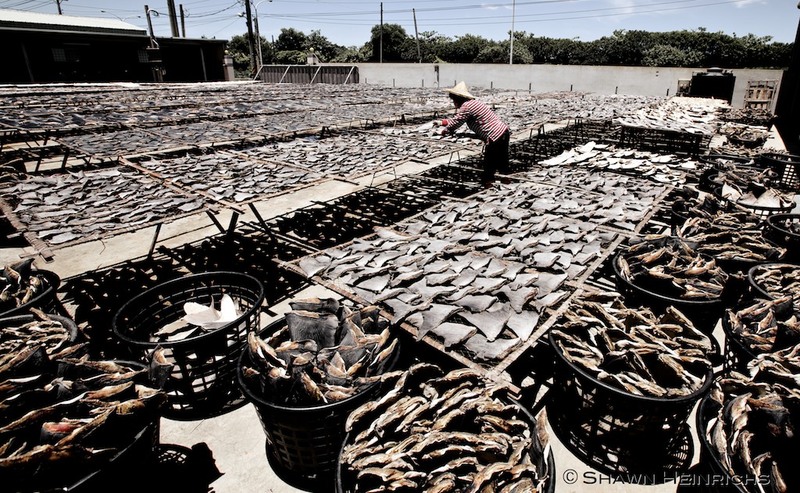 In just 2 months, thousands of these sharks are landed in this village to satisfy the insatiable demand for shark fins in China. Lombok, Indonesia – Longline vessels, often illegally fishing in Australian waters, dump the bodies of sharks into the water. I cringe as porters drive gaff hooks into the lifeless bodies, heft the sharks on the shoulders, and carry them to the auction. Everyday sharks are landed here, targeted for their fins. Lombok, Indonesia – No shark is spared. 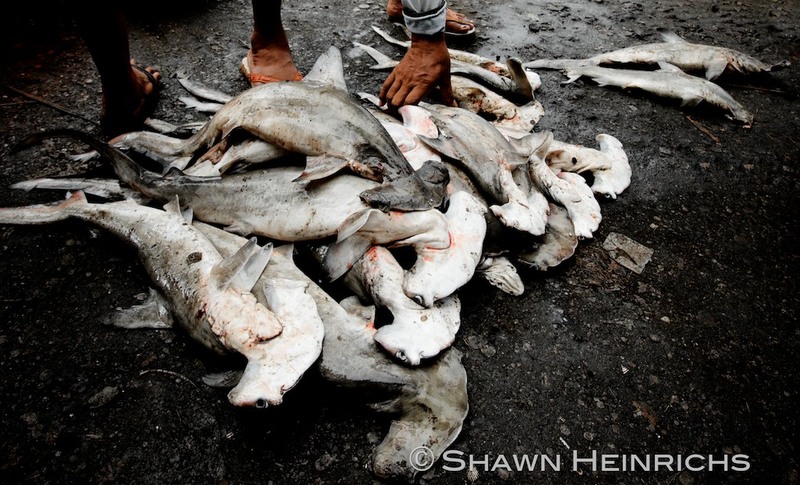 I kneel down to examine this pile of baby Hammerhead sharks auctioned for sale in the street of the market. Never to grow to maturity, these small sharks bear witness to the insanity of the trade. 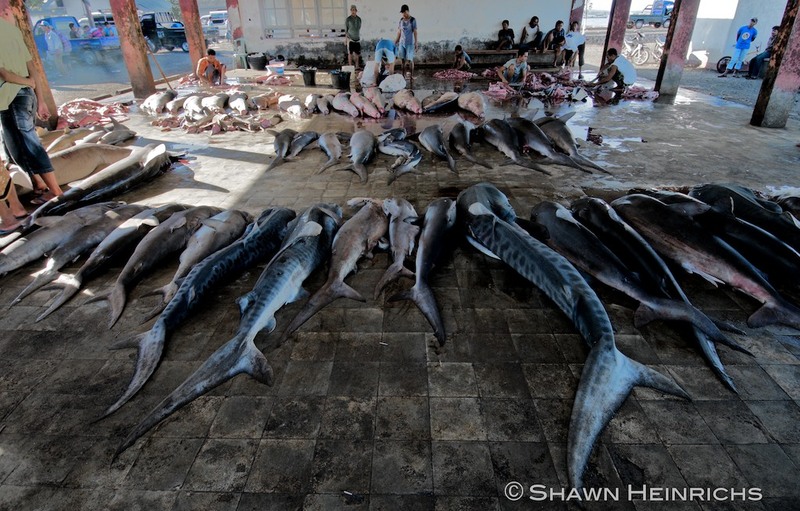 Lombok, Indonesia – The auction area fills as shark after shark is dumped on the filthy floor. Amongst the landings this day are 18 Tiger sharks, taken from a single reef. One fisherman confides in me that these Tigers were caught on a newly discovered reef where they had never before fished. 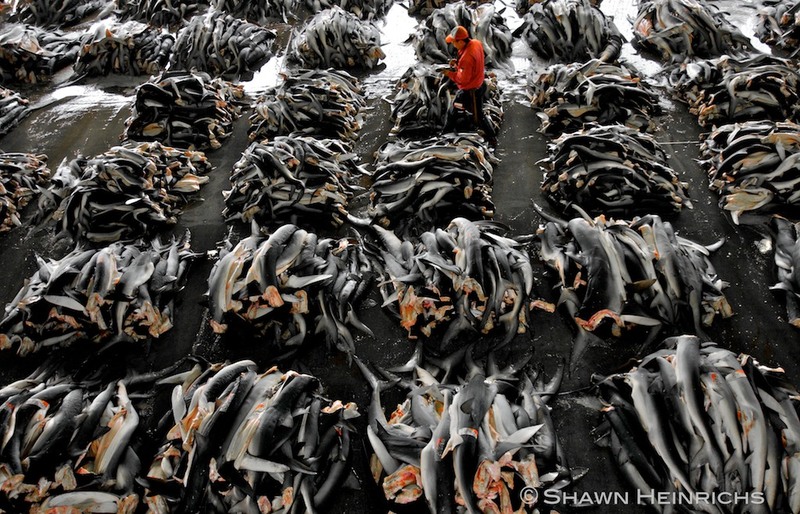 In one day they stripped out all of them, generations of these sharks lost forever. Lombok, Indonesia – No fin is too small. Fins are sliced from baby sharks and tossed in a pile at my feet. 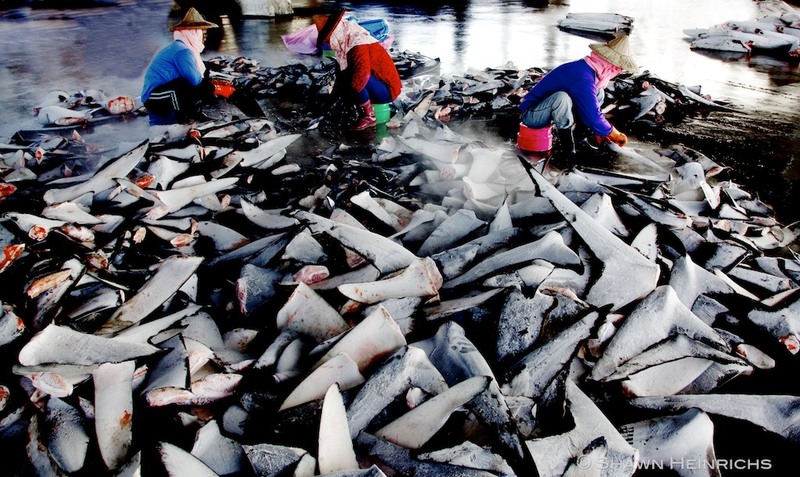 With populations of mature sharks so depleted, fishermen now target juvenile and baby sharks to satisfy the shark fin trade. Even these fishermen know that shark populations are collapsing. 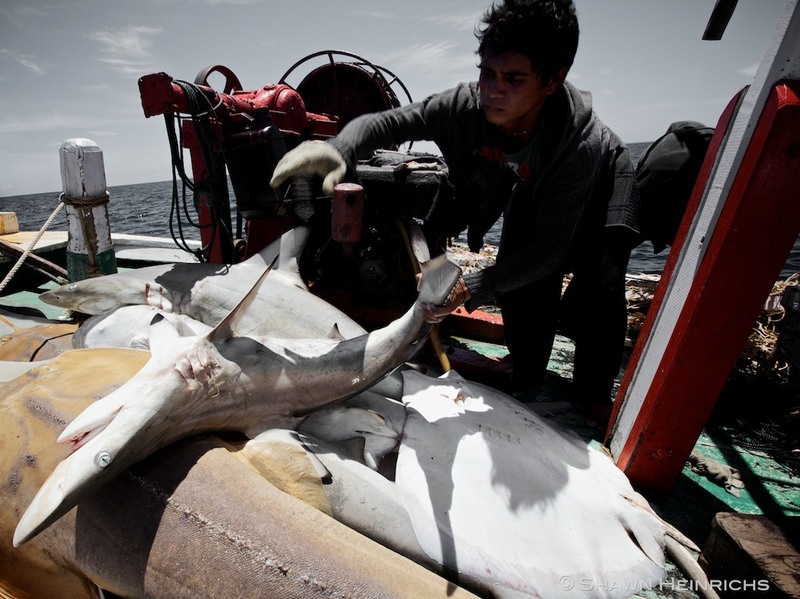 Manta, Ecuador – Hammerhead sharks are landed as “bycatch” in longline fisheries off Manta Ecuador. In reality, industrial fishing fleets have so depleted tuna stocks that fishermen now turn to sharks as their primary targets. 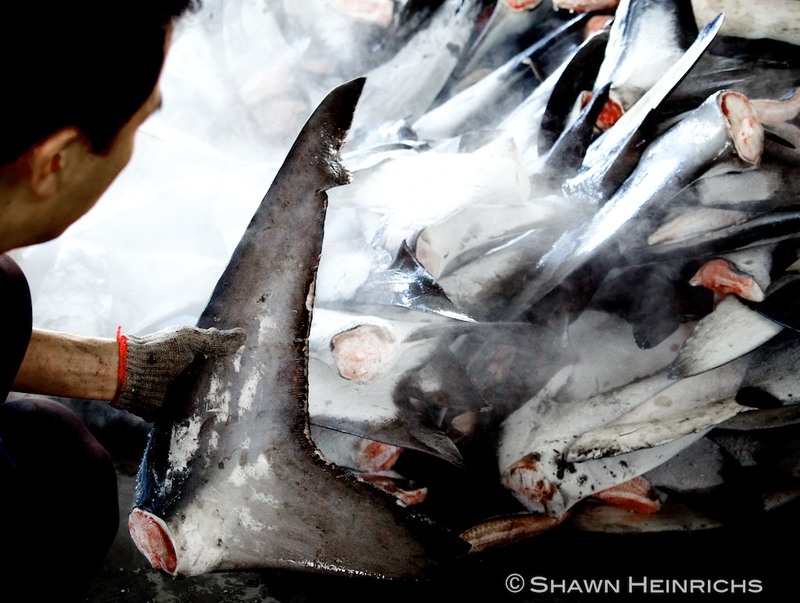 Fins from sharks captured in these directed fisheries head straight to Asia. 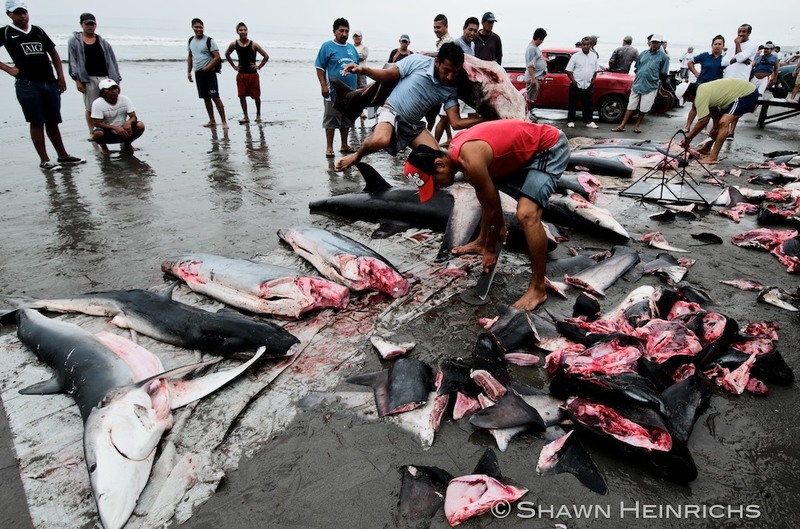 Manta, Ecuador – Mass slaughter. Blue, Thresher and Mako sharks are hacked apart on the beach in front of my eyes. Blood spatters my legs as body parts are tossed in piles. Whereas meat is of very little value, the fins fetch huge profits. This grizzly scene plays out each day on the bloody beaches of Manta. 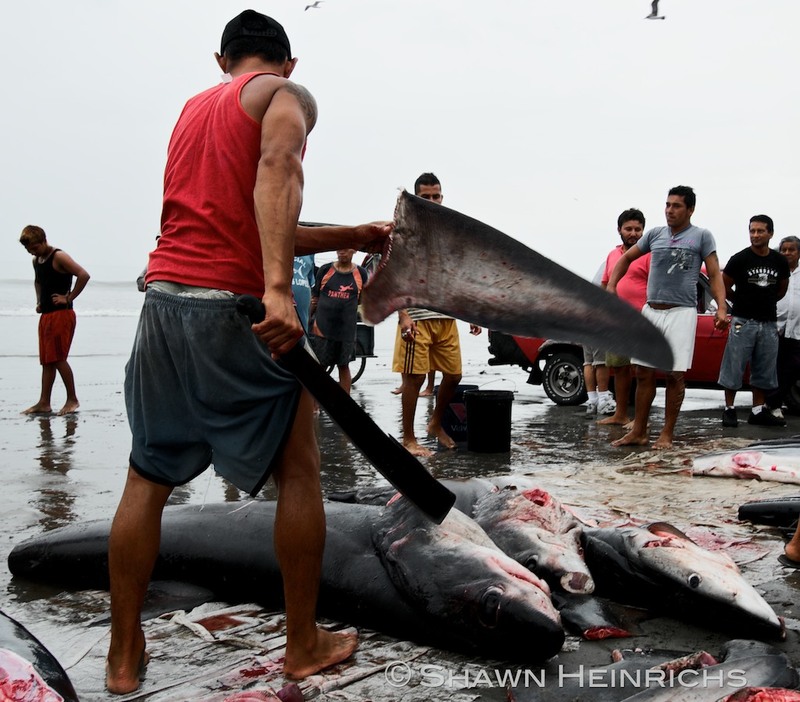 Manta, Ecuador - Alone on a remote beach on foreign soil with camera in hand, shark bodies piled up all around, an angry fisherman wields around and in a rage thrusts his razor sharp machete under my chin, shouting words in a language I don’t understand. This is no place for fear, weakness, regret or any of those emotions we have the luxury of feeling in the safety of our everyday lives. You engage, become part of it, blend in and eliminate any concern that you are a threat… you do this or do you don’t last long in this game. 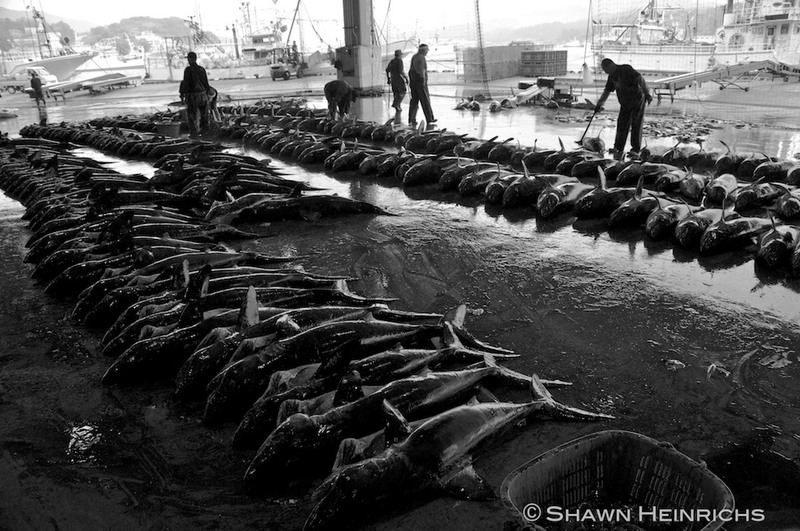 Kesennuma, Japan – The largest scale shark landings I have ever witnessed, thousands of sharks are unloaded from industrial longline vessels and lined up on the concrete floor in preparation for auction. 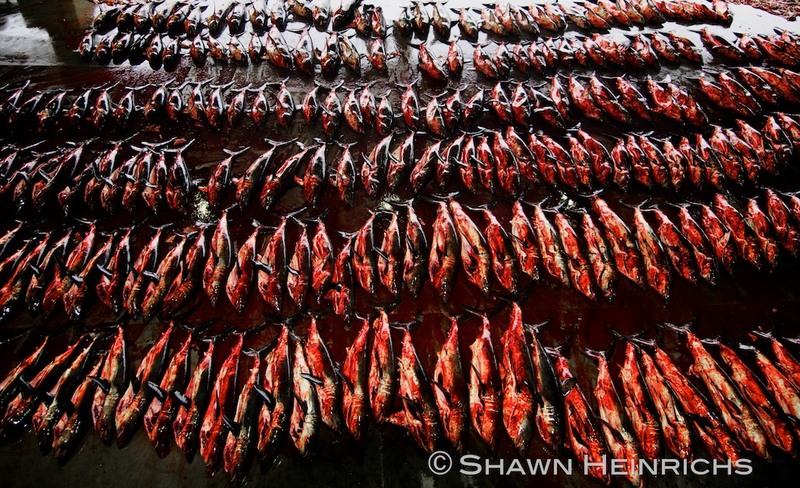 Kesennuma, Japan – Organized chaos, pile upon pile - I watch in disbelief as literally thousands of Blue Sharks are stacked in neat piles in preparation for auction. 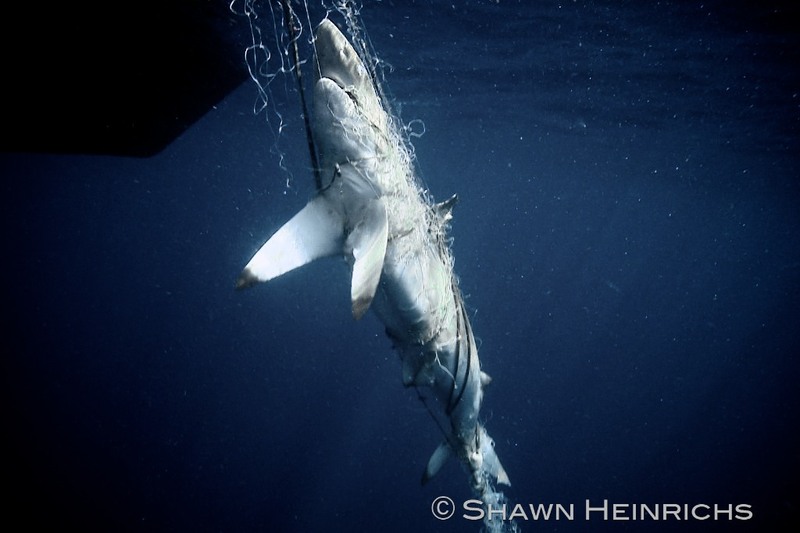 With a ruthless efficiency, the industrial shark fishery is taking a devastating toll on pelagic sharks populations – the scale of this destruction is simply beyond comprehension. Kesennuma, Japan – The face of the 100 million. Blood soaked floors, the stench almost unbearable, hundreds of salmon sharks are lined up, weighed and then their fins are sliced off. 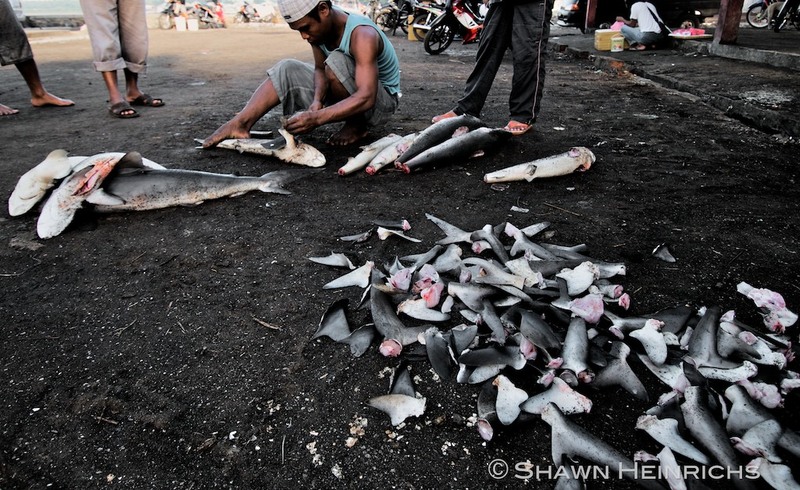 I reflect that in this one port alone, millions of sharks are landed each year. 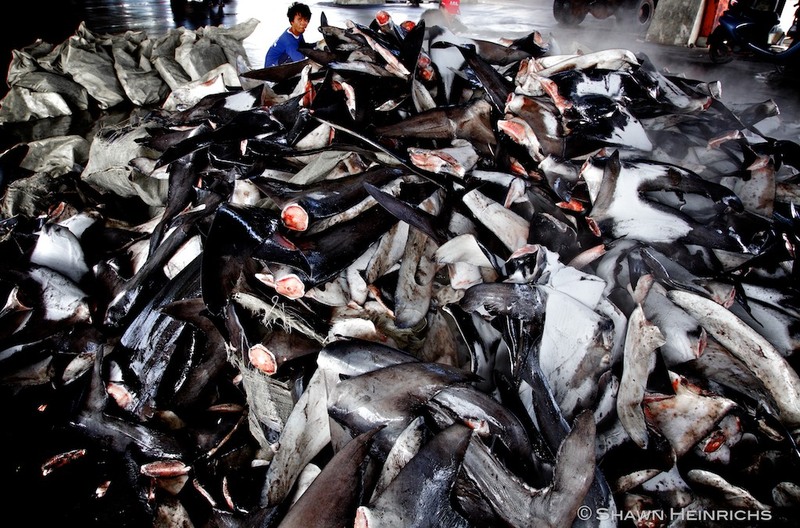 Then the depressing reality hits me, the estimated 100 million sharks landed globally is likely an understatement. We don’t have much time. Tung Kang, Taiwan – I watch as close to 100 ‘dressed’ shark carcasses are unloaded from a Taiwanese long-range longline vessel. The conspicuously missing heads and fins disguise the fact that these were once beautiful, awesome predators. 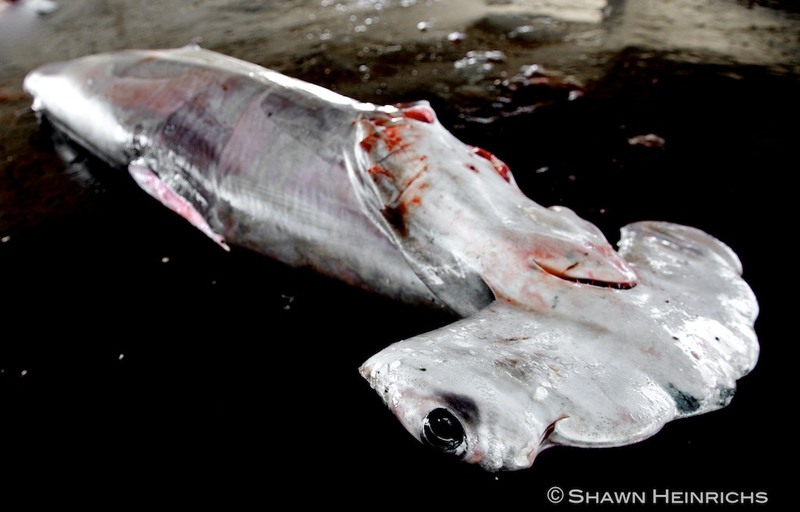 Tung Kang, Taiwan – Looking into the sad eye of a butchered Hammerhead, lying alone on the filthy concrete floor, it strikes me how this brutalized animal reflects the true consequences of the shark fin trade. For every set of fins, this is the cost. 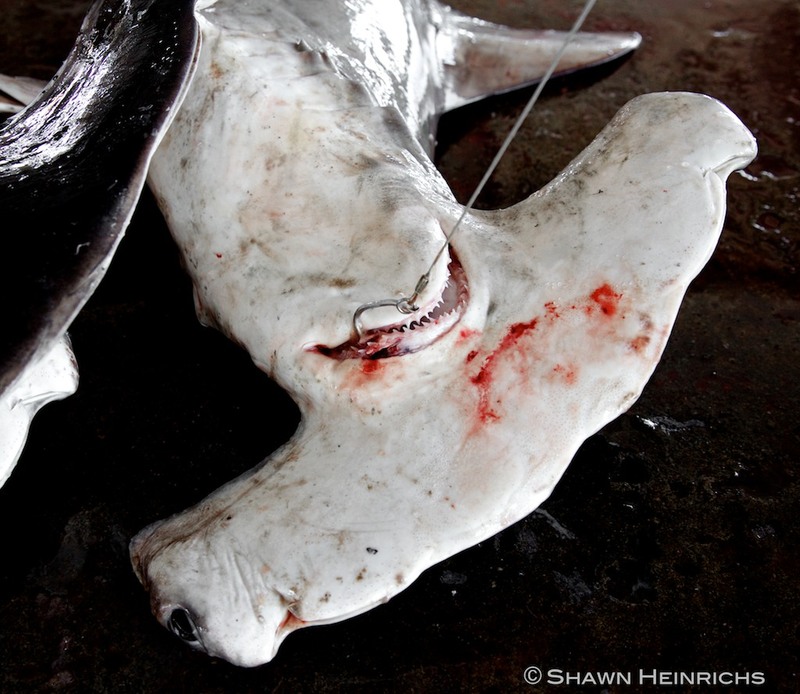 Tung Kang, Taiwan – Longline hook still embedded in it lifeless jaw, this Hammerhead provides just a glimpse into the reality of industrial longline fisheries. 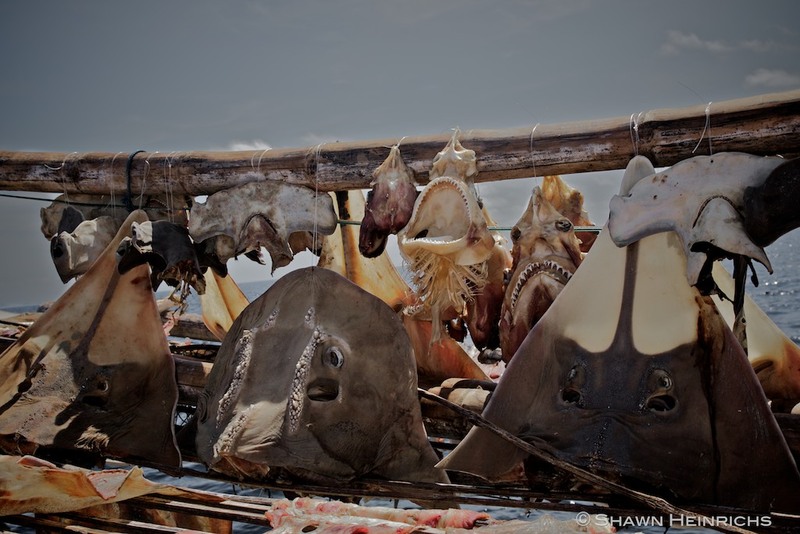 Tung Kang, Taiwan –Grotesquely fascinating, this orderly stack of Hammerhead corpses disguise a vicious reality, that hammerhead populations have been depleted by as much as 99% in some regions, ravaged by unbridled longline fisheries. 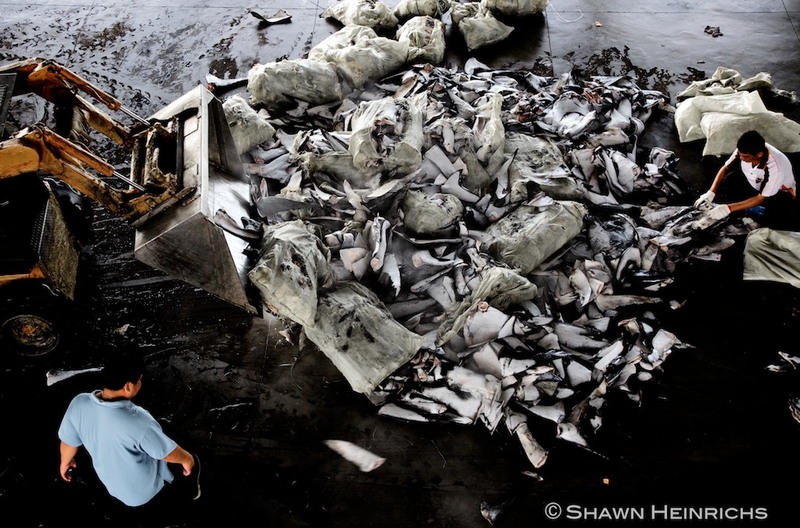 Tung Kang, Taiwan - Finned and gutted, the bodies of Hammerhead and Silky sharks are scattered on the filthy floor of the port. Though the fins are valuable, the meat is worth relatively little. 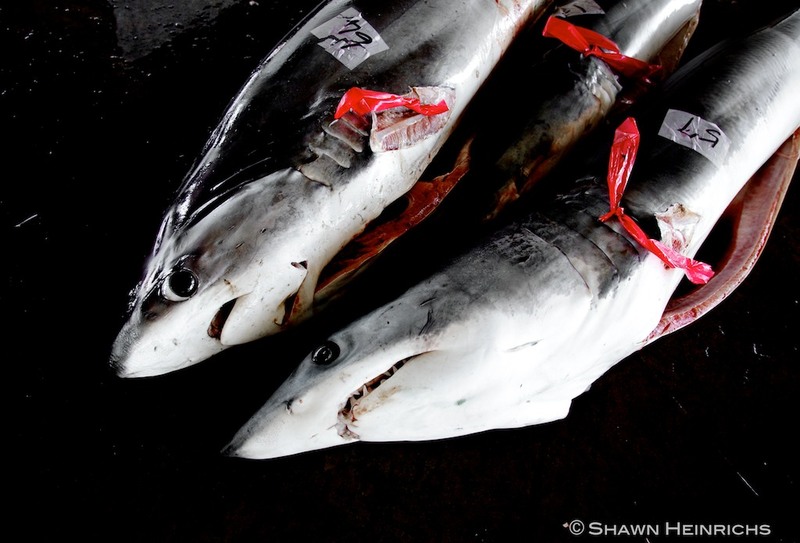 Tung Kang, Taiwan –Staring into the dark, beautiful eyes of these Mako and Thresher sharks, I am reminded how they are targeted intensively for their valuable fins and meat, and as a consequence, their populations have been severely depleted. 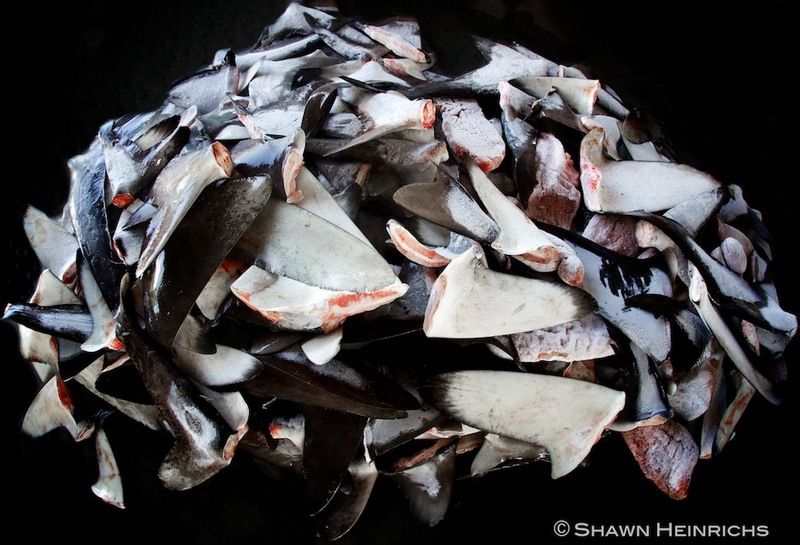 Tung Kang, Taiwan – What is the cost of the shark fin trade? 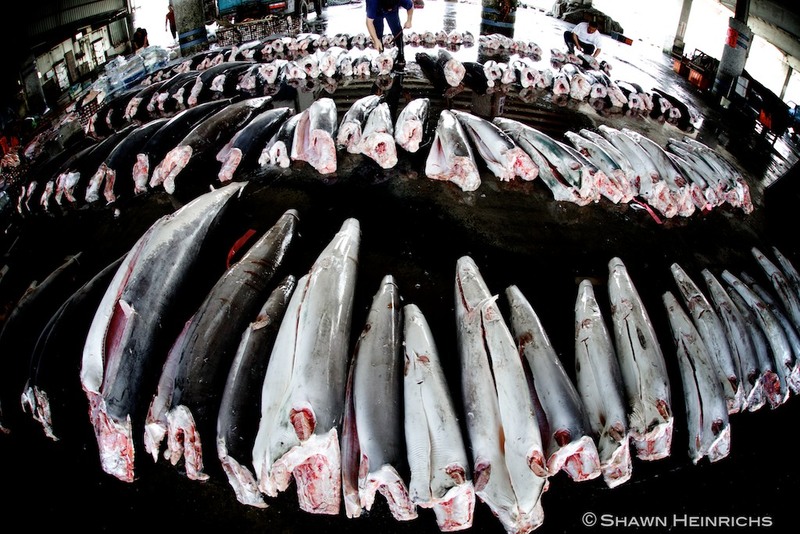 For every set of fins, a powerful and graceful predator was needlessly slaughtered. 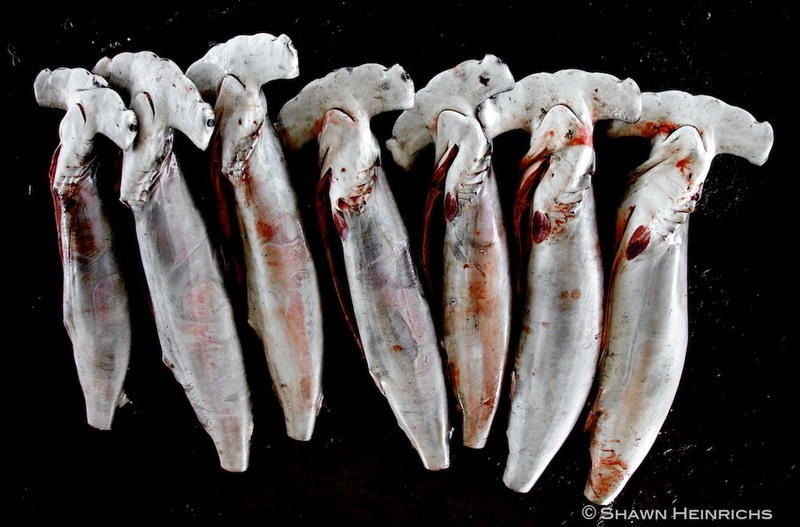 Tung Kang, Taiwan – Sliced, sorted and priced for sale, the Ocean’s apex predators are reduced to this, a basket of fins. 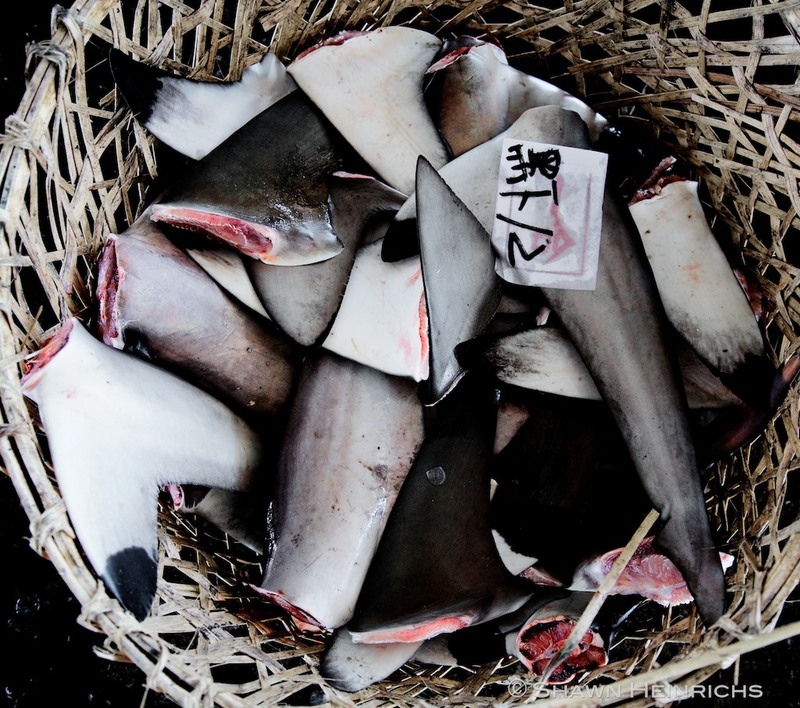 Tung Kang, Taiwan – Ignoring the longlines, the commercial fishing vessels, the ports, the processing facilities, all of it – I focus on what is driving the destruction – the absurd demand for shark fins that has fueled a global epidemic. 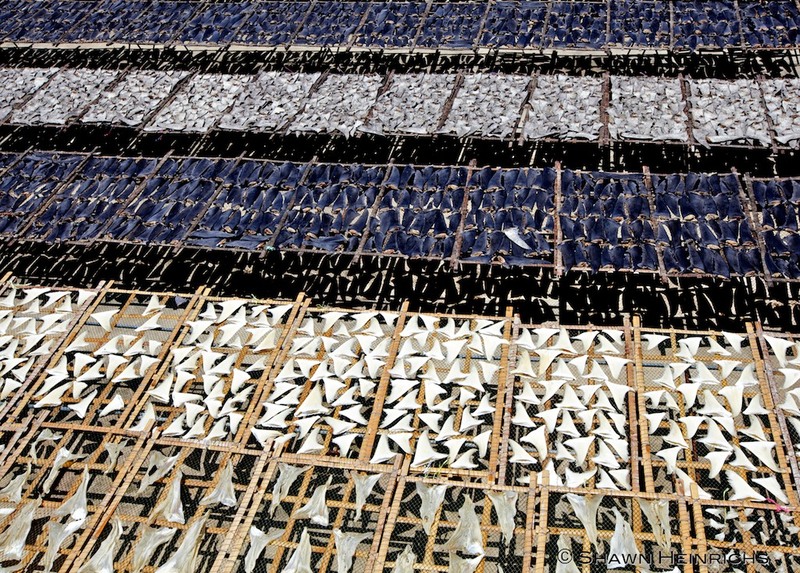 Tung Kang, Taiwan – I count over 120 bags and an estimated 10,000 fins offloaded from a single Taiwanese longliner! From the same vessel, less than one hundred shark bodies are accounted for. The quantity of fins is so great that frontend loaders are required to move them. Tung Kang, Taiwan – Face-to-face with carnage form the destruction of several thousand pelagic sharks, I do some quick math. Taiwan has an estimated 2,000-registered longliners, each deploying as much as 100 miles of longline. That’s 200,000 miles of longline, enough to wrap around our planet 8 times – and Taiwan is only the 4th largest shark fishing nation! Tung Kang, Taiwan – Strange, morbid beauty, the vibrant colors of the factory workers disguise the grisly reality – these workers are participants in greatest slaughter of large marine species ever in the history of our planet. 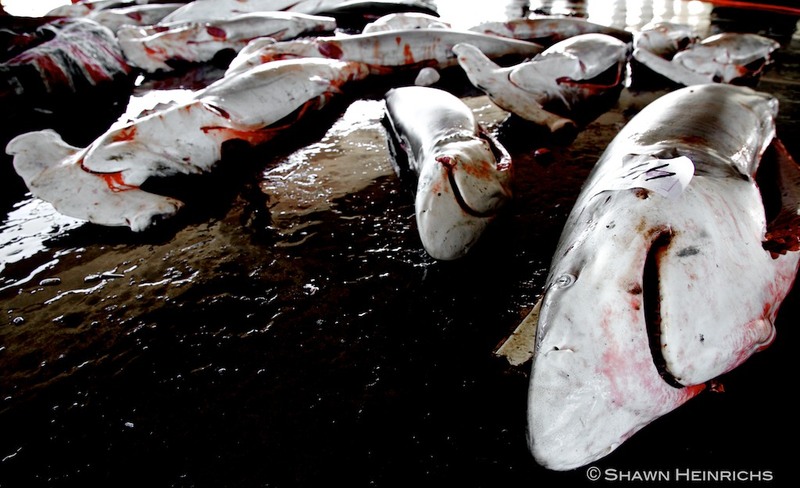 Kaohsiung, Taiwan – Beyond comprehension, thousands of fins dry sun in a Taiwan processing facility. I learn that this a daily occurrence and that this is just one of many facilities in this area processing huge quantities of fins. Kaohsiung, Taiwan – Symmetry, shape, color and shadow draw capture my attentoin, disguising the cruel reality of the bloodshed behind the trade. I imagine that this is the detachment that the traders feel when they look upon these fields of fins. 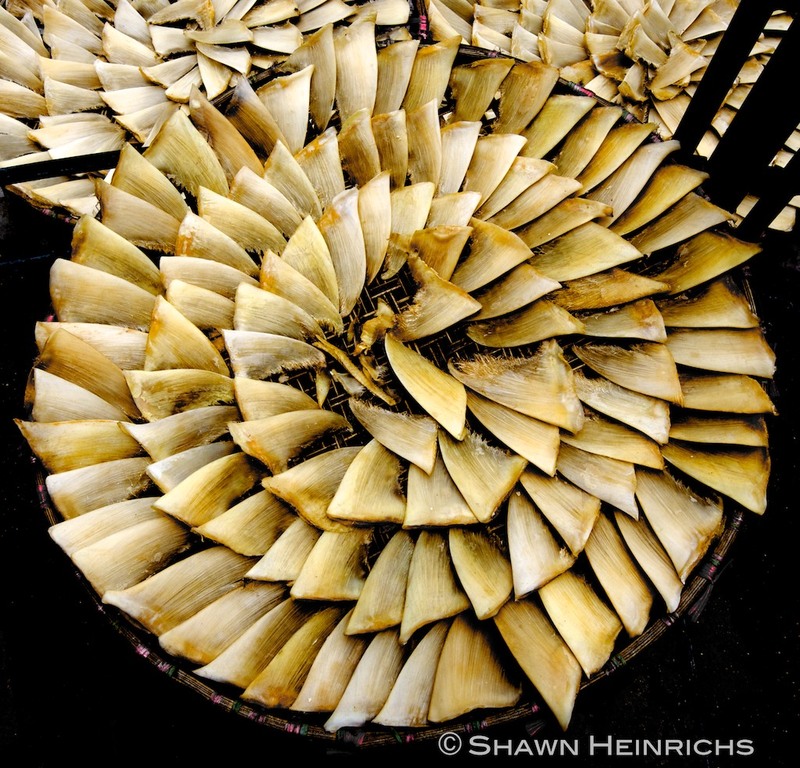 Hong Kong – Fins in spiral, dry on a rack on sidewalk in front of a shark fin trader. To a local passerby, this is a common occurrence not worthy of even a glance. To me, this is the death spiral prorogated by the Hong Kong shark fin trade, historically the epicenter of the shark fin trade. 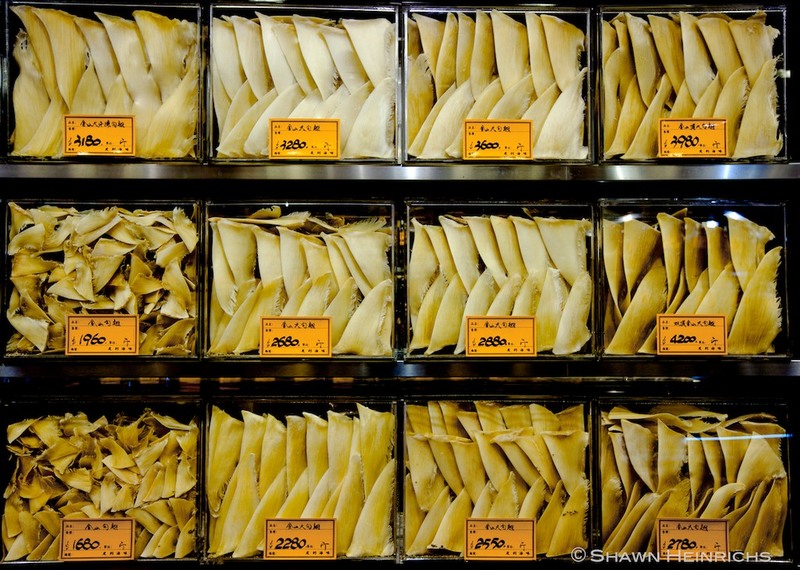 Hong Kong – Carefully sorted by size and grade, fins are displayed for sale in a shark fin trader’s store. Sadly, this is the end of the line for most sharks. Amidst all this death and destruction, I sometimes ask myself why I even bother to persist? The reality is, the outlook is pretty bleak and we are fighting an uphill battle. The forces of destruction far outnumber the forces of conservation, and for every dollar spent to conserve a resource, 10,000 dollars are spent to extract it. Fortunately, this massive imbalance in numbers is countered by the incredible passion and commitment of the people engaged in conservation. 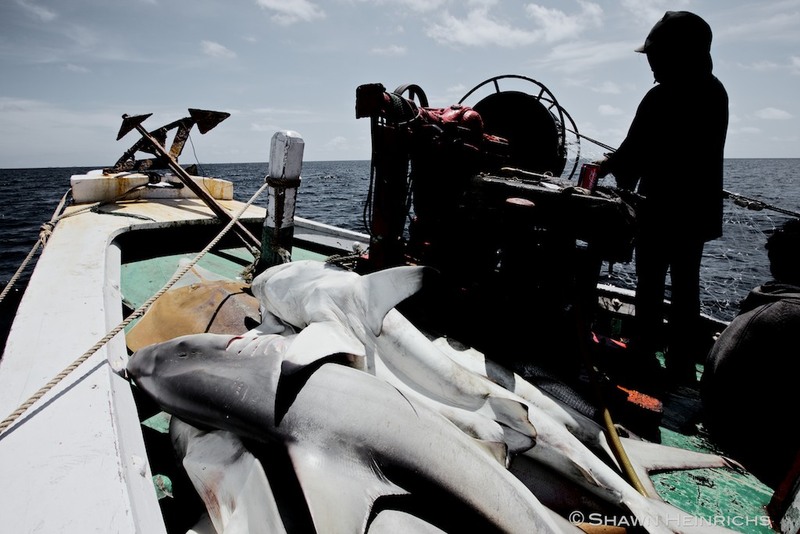 And nowhere are more dedicated and sacrificing individuals found than in the field of shark conservation. I am blessed to call these people my colleagues and friends, and I believe we will ultimate succeed in ending the slaughter. Together, we are accomplishing more than I ever imagined. In the past two years, the tide has begun to turn with shark sanctuaries and shark fin legislation coming online in key regions across the globe. I take this moment to recognize these individuals. 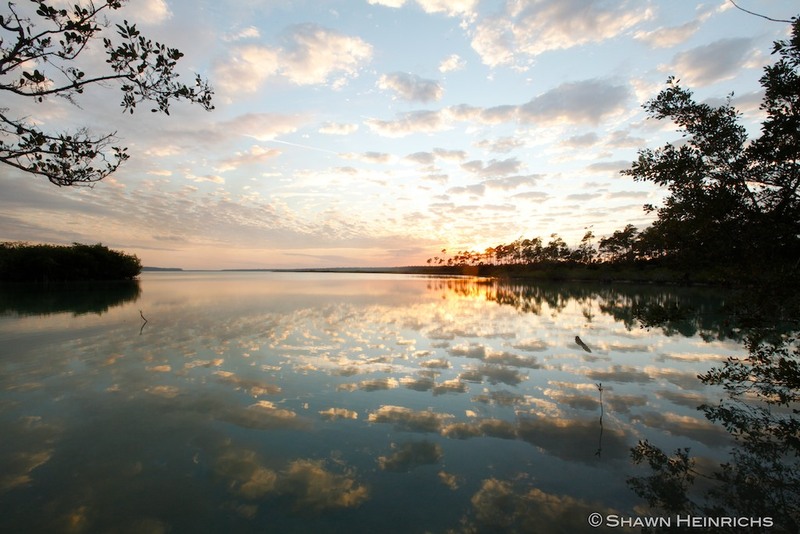 Andros Island, Bahamas – In the setting sun, the Bahamas rises as a shining beacon of hope for shark conservation. In July of 2011, the Bahamas declared the waters or it’s entire EEZ a sanctuary for sharks, fulfilling a dream started in 2008. Andy & Marit Miners –Pure sacrifice and uncompromising integrity are words that just scratch the surface when describing two of the most committed people in marine conservation. By their initiative, we have secured over 1200 sq. km. of some the most bio-diverse reefs on earth and restored shark populations in an area once ravaged by shark finners. 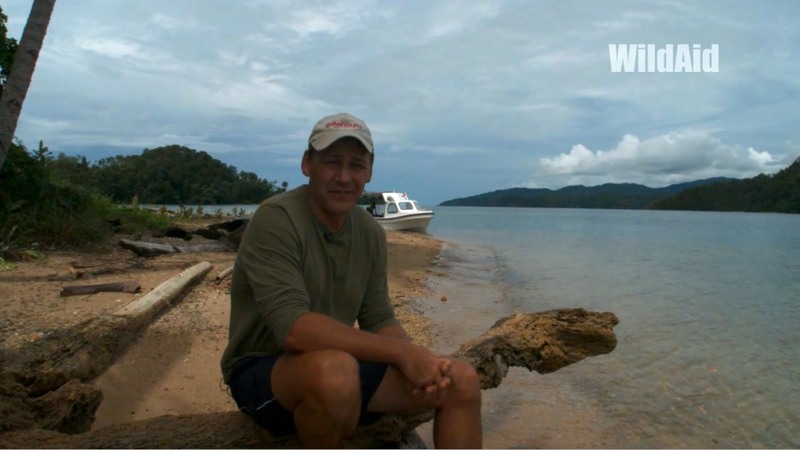 Paul Hilton –No nonsense and steadfast, Paul has been exposing the destruction of industrial fisheries and the brutality of the wildlife trade for well over a decade. I have worked shoulder-to-shoulder with Paul in some of our most difficult and challenging investigations to date, and there is no person I would rather have by my side when situation gets heavy. John Weller –A world-class photographer, writer, and orator, John is dear friend and my inspiration to become the best artist I can be. John is uncompromising in his commitment to perfection, and his uncanny ability to capture the true human connection to nature will change the world. Jim Abernethy –The man who loves sharks - in addition to being an author and an incredible wildlife photographer, more than anyone Jim has shattered misconceptions about the nature of sharks. 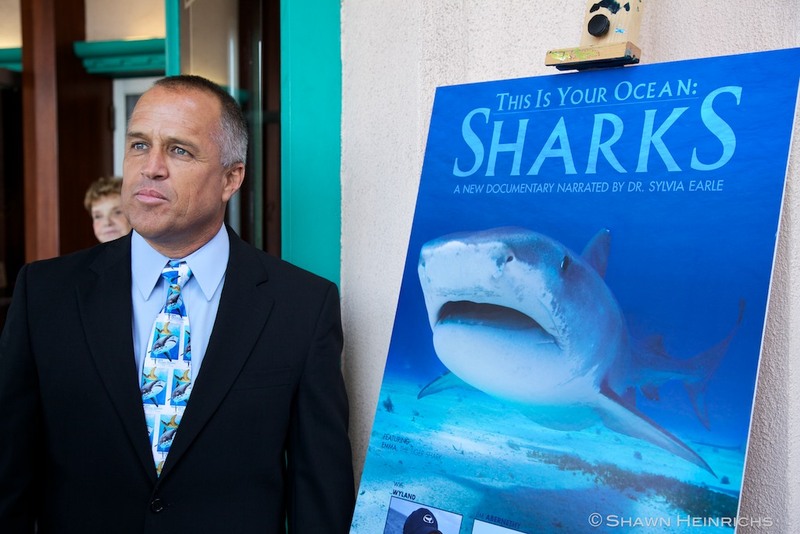 Following up on This Is Your Ocean Sharks (directed by my good friend George Schellenger), I look forward to producing our next exciting film together. I am honored to call Jim one of my closest friends. Mary O’Malley and her husband Lupo – One of the greatest unsung heroes in shark conservation, Mary is a force to be reckoned with. Tireless and uncompromising, she has played a decisive role in just about every piece of shark fin legislation and shark sanctuary to date. In Florida, sharks are finally gaining much needed protection largely due to her efforts. Mary, you are awesome! Stefanie Brendl & Clayton Hee - Teaming up with Senatore Hee, Stefanie’s personal sacrifice and unyielding determination resulted in a victory for the Hawaii shark fin legislation, probably one of the most decisive wins in shark conservation history. 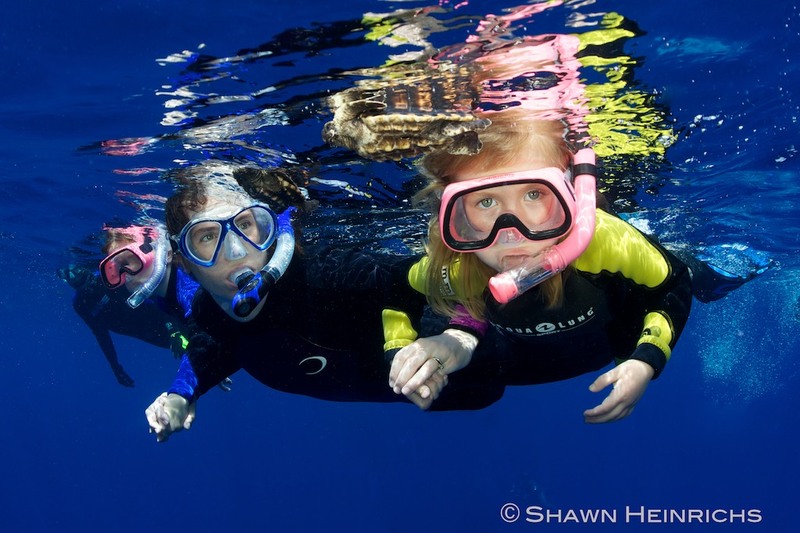 Stefanie has quickly become a force in Pacific shark conservation. 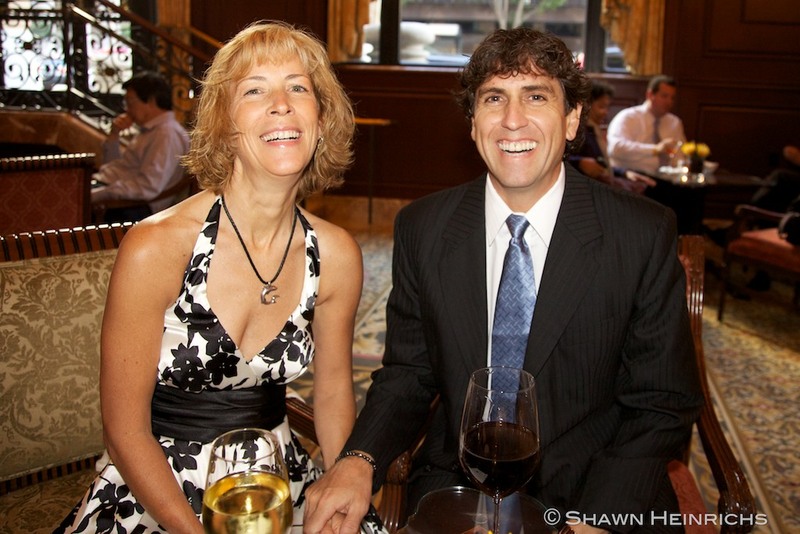 In addition to being my colleague in the Pacific Shark Initiative, I am so excited to have Stefanie as my close friend. 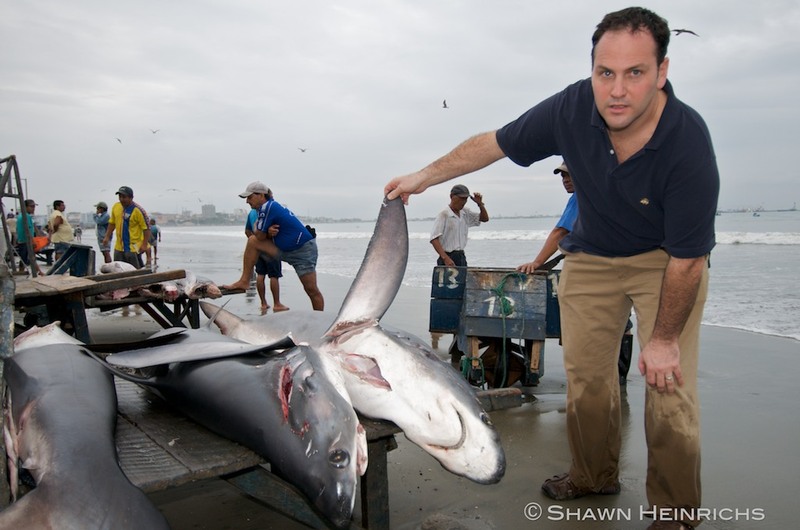 Matt Rand - No ego, tireless and uncompromising commitment to true conservation, Matt with the shark team at Pew has reshaped the face of shark conservation. Massive wins in both sanctuaries and shark fin legislation can largely be attributed to his work. I am truly privileged to work with Matt and I am proud to call him my friend. 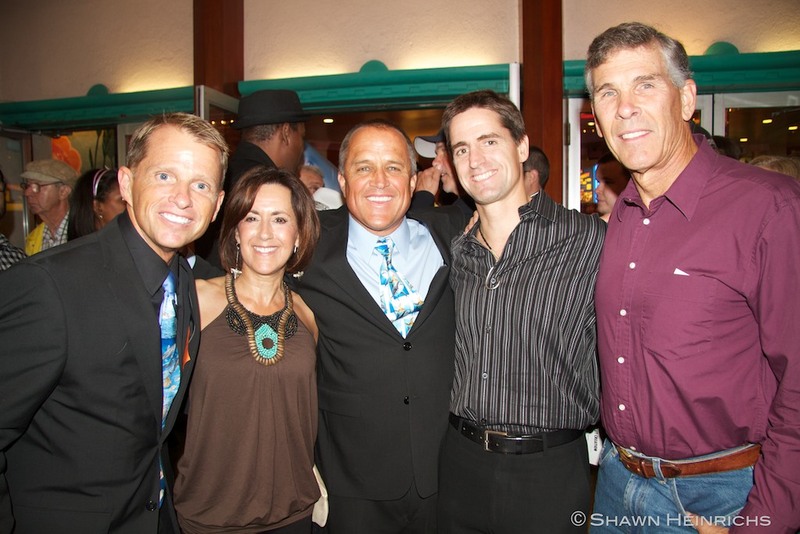 Michael Skoletsky - Never one to promote himself, Michael has quietly assembled an impressive team of the movers and shakers from the dive and underwater imaging community, to counsel and drive Shark Savers initiatives. 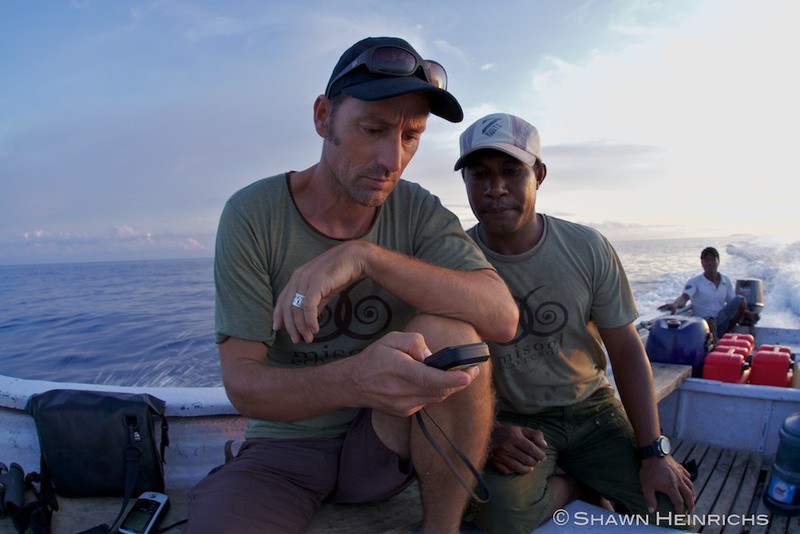 Sincere and focused, Michael is a constant in the battle to save sharks. He is also a true friend. 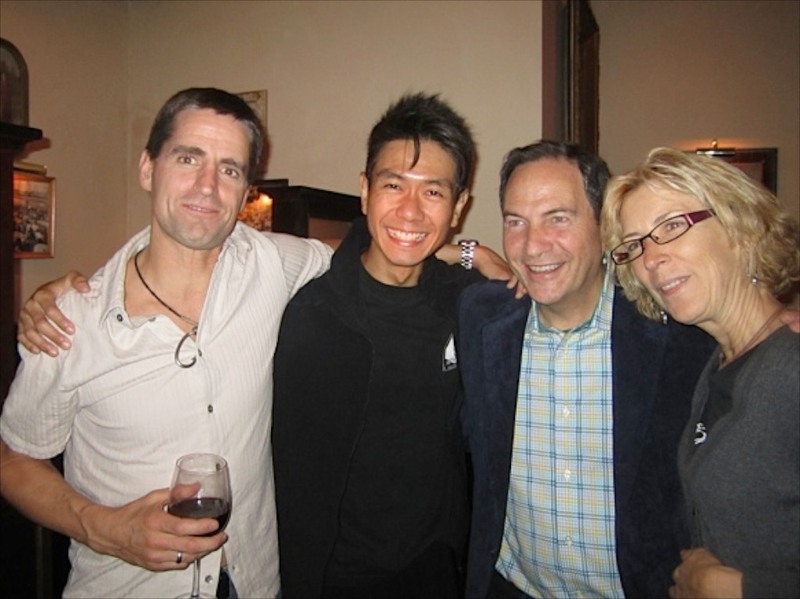 Peter Knights - Unwavering in his commitment, Pete has been at the forefront of the battle to end the shark fin trade for well over a decade. A man of few words and serious action, under Pete’s leadership, WildAid has achieved the unimaginable, and bringing hard-hitting shark conservation media to hundreds of millions of people in China. Having worked frontlines with Pete for many years, I consider him a close friend and important ally in the battle to end the shark fin trade. 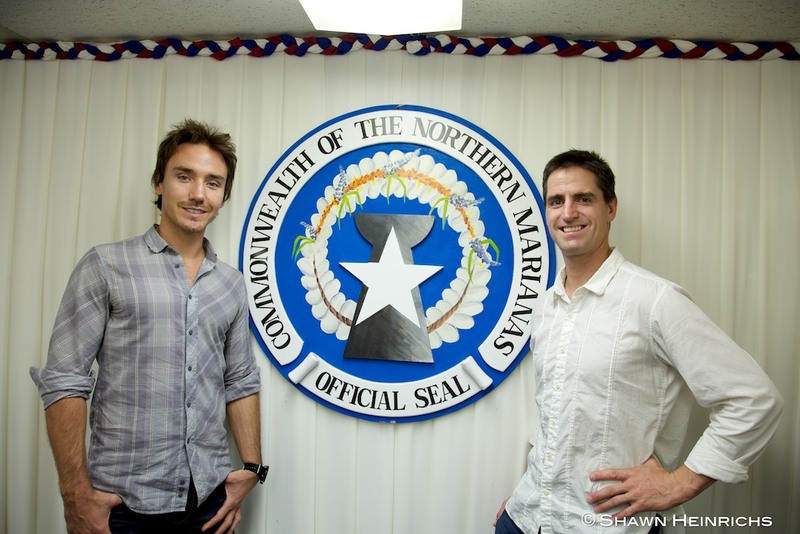 Rob Stewart – Rob created one of the most important films in shark conservation to date. 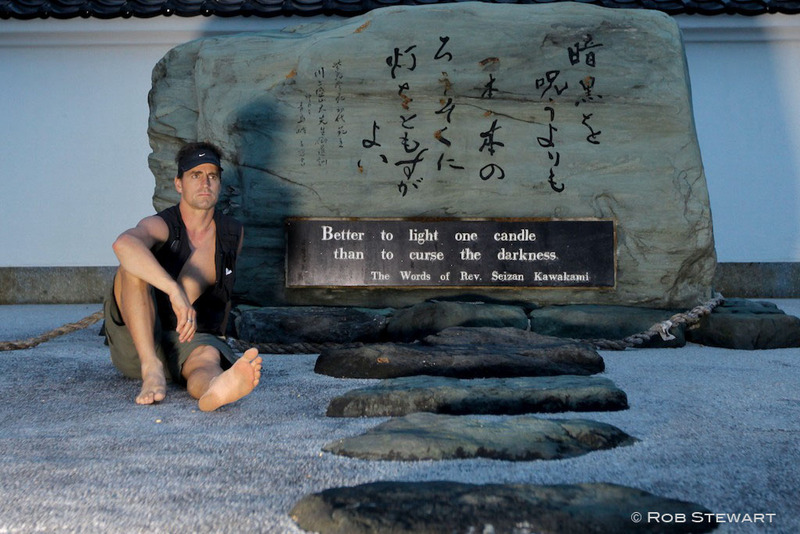 Exposing the story of global shark destruction to the world, Rob’s film has inspired people to stand up and fight for sharks. Rob and I have faced together some of our most discouraging shark conservation experiences, but also some of the most inspiring victories. I look forward to continuing to work with Rob as an ally in race to end the destruction of sharks. 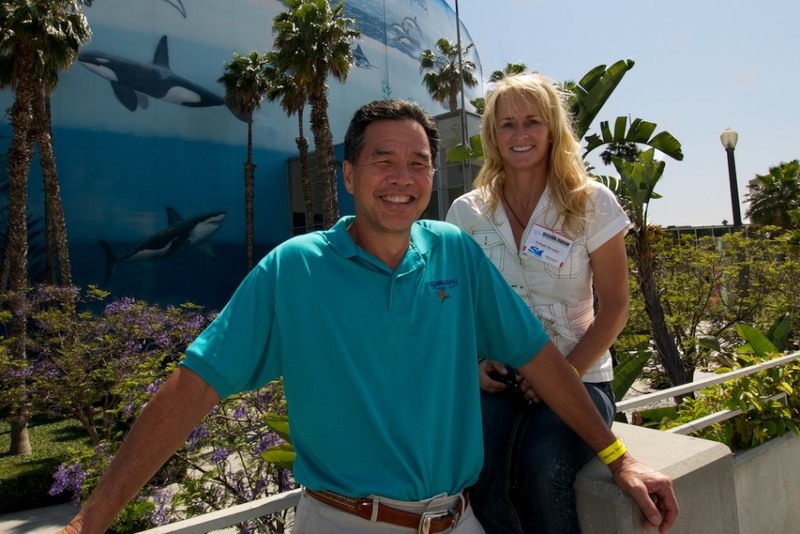 Howard and Michelle Hall – Passionate about the Oceans, their films have inspired fascination and appreciation of the Oceans by millions across the globe. 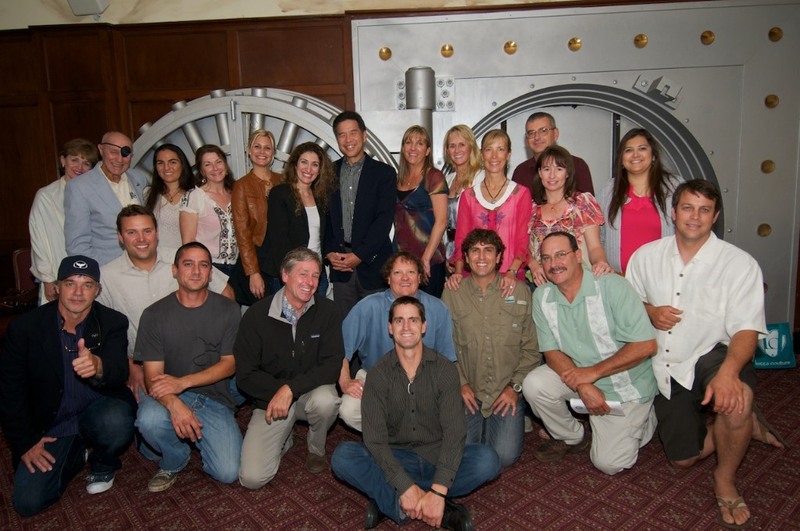 The work of these industry icons offers a true testament to the power of media in engaging people in conservation. And above all else, they are kind, wonderful people and their friendship is something I treasure. The California Coalition – They proved that we could all come together and truly make a difference. 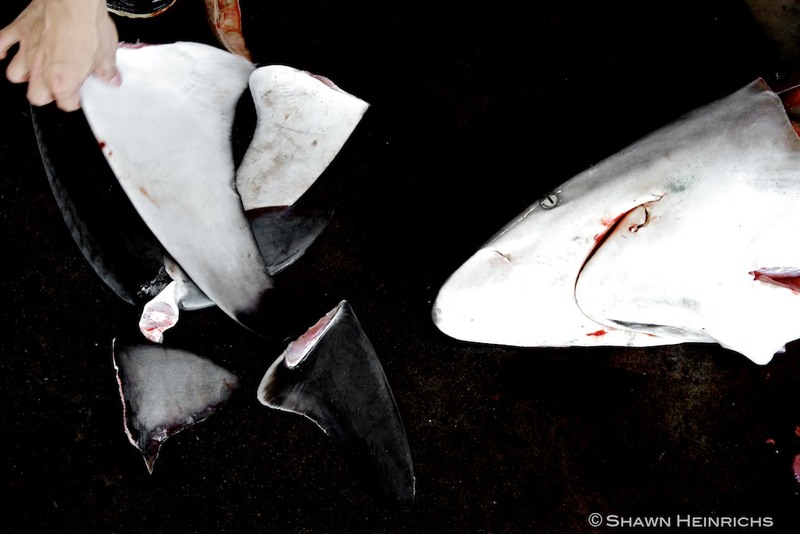 Refusing to yield in the face of massive industry opposition and powerful lobbying forces, the California team achieved a shark fin ban in one of the top 10 economies in the world. I cannot say enough about this team. Yao Ming – When he speaks, hundreds of millions listen. Refusing to back down in the face of intense pressure levied by shark fin industry pundits, Yao is our key to securing a ban on the shark fin trade in China. Yao is a real-life hero. My Family – Without the love, support and encouragement from my wife and two beautiful daughters, I could never have persevered in the face of such overwhelming obstacles. I believe we must act now to preserve the health of our Oceans for future generations, or face severe environmental consequences beyond even the worst predictions. My family sacrifices so much in support of my demanding work schedule and extensive travel, and for this I cannot thank them enough. I love you guys! As I look back at the decade of work behind me and the lifetime of work that lies ahead, I take comfort in knowing I have the company of such a remarkable group of friends and allies on this journey. In the past 2 years especially, we have accomplished more than any of us could ever have imagined. I believe this has inspired all of us to work harder, sacrifice more and set even more ambitious goals. We will not stop until the battle is won. Better to light one candle than to curse the darkness – The words of Rev. Seizan Kawakami serve as a daily reminder to me of why we must continue to fight in the face of seemingly insurmountable odds. By taking a stand for what is right, we create a beacon for others, and maybe, just maybe, we will ignite a blaze that will spread across the globe and change the world.